We recently took a trip to Brockenhurst.. haven't been in a good year! Such a beautiful quaint village, i found a really lovely bakery called Rosie Lea's. It had fab reviews on trip adviser so thought it would be ideal for afternoon tea with the children. I would definitely recommend booking as it is rather small but lovely. We had an afternoon for two which was £19. The staff were lovely, really polite and helpful. The sandwiches were good really fresh and tasty and the scones were honesty the best I've ever tasted! They were warm and not dry at all like some I've had before. I loved the vintage style of the bakery with cute floral plates on the walls and all the tableware was very pretty , vintage and floral. Quite a classic feel to a little bakery. I decided to take the kids for a good walk in the forest to tire them out and burn of the clotted cream ha! We headed into the New Forest one of our favourite walks to do actually. Its not too long and theres a little stream for the kids to have a paddle in at the bottom. It was such a beautiful day it really felt like summer which says a lot especially since the last week has been so wet! 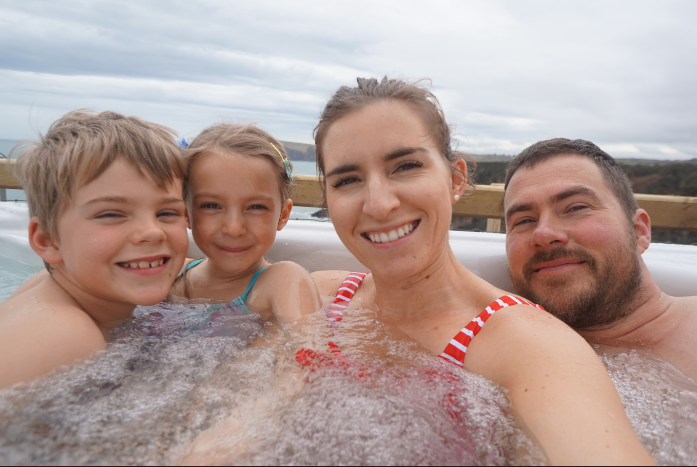 Check out our recent weekly Vlog for our full day out.